My kitchen serves Slow Food with cozy atmosphere and enjoys nice wines. 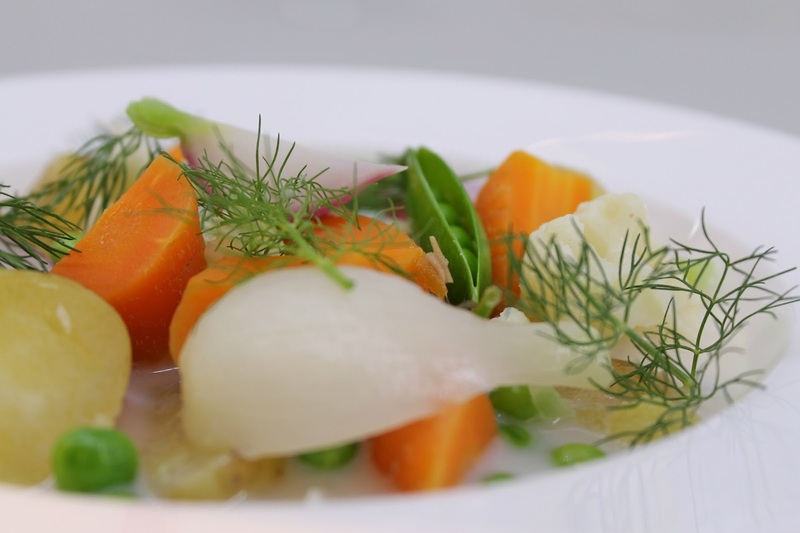 Finnish summer classic, Kesäkeitto, is creamy soup made of summer veggies. 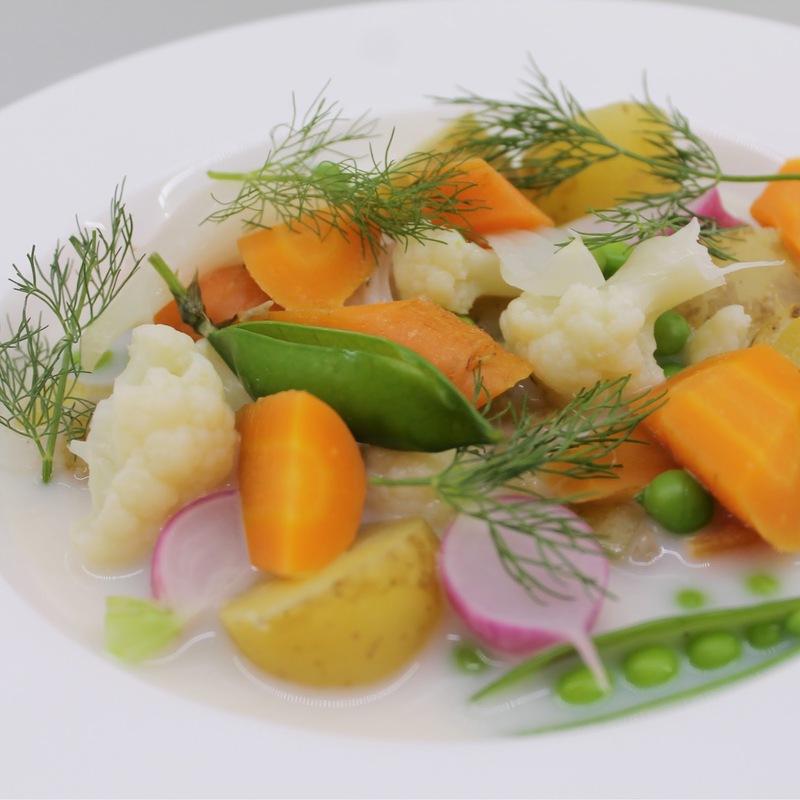 For me, this soup encapsulates all wonderful flavours from new fresh vegetables and it is the taste of summer. The way I make my Kesäkeitto is bit laborious since the ingredients are not cooked all at the same time. I want to respect these great vegetables and give them a result they deserve. All veggies are perfectly cooked by parboiling, to ensure optimal taste experience. Even this requires more work than traditional way, this definitely is wort the effort. This is how you should make the Kesäkeitto! Cut the cauliflower into a size of a fingertips. Cut carrots, radishes and potatoes. Peel the most of the pea pods to a bowl, but leave the smallest unpeeled. Cut the white part of the onions from the green tops and cut onions intoa a 4-6 wedges. Bring the vegetable stock to a boil in a pot, add cauliflowers and carrots and cook them 4 minutes. After 1 minute, add onions. Using a skimmer, lift all vegetables to ice water for a while, then let them dry on a kitchen towl (or paper towl). Add peas to boiling vegetable stock and cook 1 minute and radishes 30 seconds. Cool similar way than the above mentioned veggies. Cook the potatoes in a stock until tender, add cream, butter and all parboiled veggies. Bring to a boil, to re-heat the veggies and when boiling, remove pot from the stove. Season with salt and allspice. I have spent a lot of time in Seoul over the years, and I have fell in love totally in Korean food, especially kimchis. Yes, I have used plural on word "kimchi", since there are large variety of diffrent kind of kimchis, not just that one people thinks. Baechu kimchi is the one that everyone will know when you mention "kimchi". It’s made of salted and rinsed cabbages whose leaves have been packed and coated with a mixture of cochugaru, onion, garlic, ginger, green onions, and fish sauce (or shrimp or oysters). It’s then put into a container to ferment during storage and can be kept for months or even longer in the fridge. 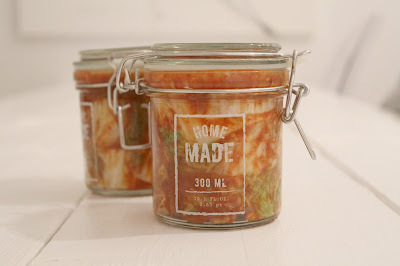 Everyone has their favorite stage of baechu kimchi fermentation; it can be eaten fresh and is juicy and delicious when newly made, but, as it ages, it becomes more sour and better fermented. Some old men claim that kimchi cannot rotten at all, but I'n not convinced yet. After year or so, my Korean business mates started to tease me, how korean I have become. Well, the main reason, I think, was the fact that I ate like korean people and already at time I had gathered a lot information about the korean dishes. They also laughed that "She really knows her kimchi...". After few years, I got the biggest complement I could imagine, from my korean friends. I got the recipe of Baechu kimchi from my business mate's grandma. It was in korean originally, and I made huge work to translate it in finnish, and now it is available in english too. 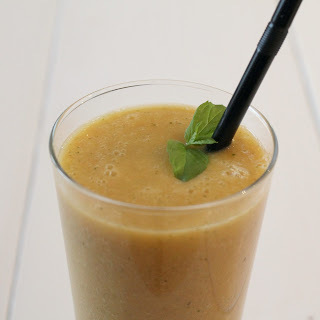 For me, this one is the authentic recipe, and I have used it ever since. Dissolve salt in water. You might need to heat the water to dissolve all salt. Cut the napa cabbage in half (lengthwise) and soak in salt water for 6 hours to overnight. Once the cabbage is soft, remove from salt water and rinse thoroughly. Chop up the cabbage approx. 3 cm wide strips. To make the paste, add the sweet rice flour and one cup of water to a pot. Put over medium heat and continue to stir until thickened (about 5 mins). Transfer paste to a large bowl and add the cochugaru and fish sauce. Mix well and let the paste cool. Add pear, green onions, onions, garlic, and ginger to the paste and mix. Massage paste into the cabbage and store in a jar. Let it set in room temperature for few hours to overnight, and move to fridge. Serve immediately if you like fresh kimchi. If you like it more fermented, wait until it fits your tastes. For me, after one week, it is perfectly fermented. Ps. 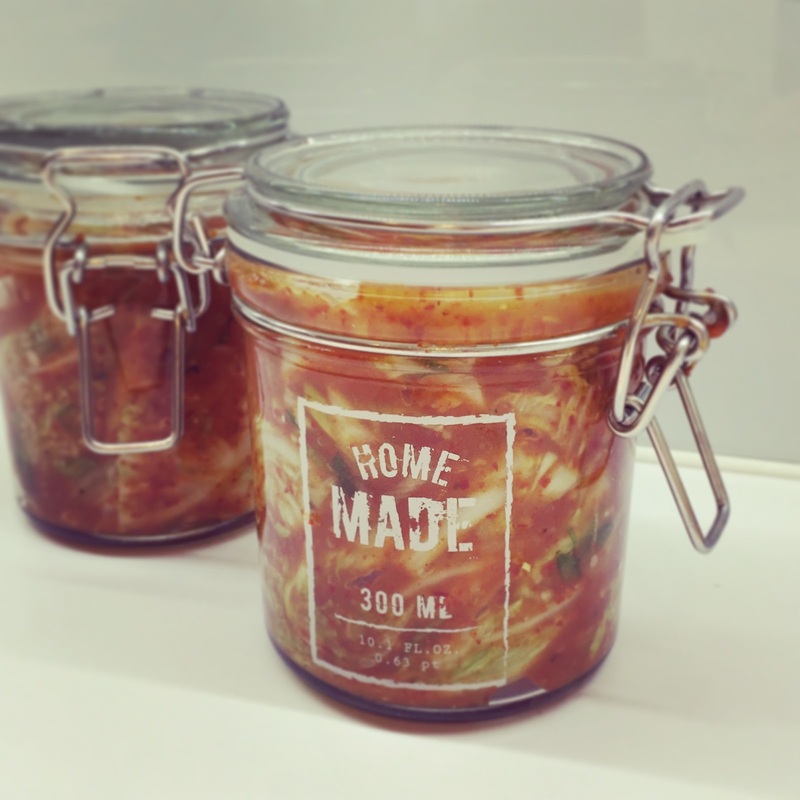 Whenever you take out any kimchi, press down the remaining kimchi and submerge in the liquid or the kimchi will become very bitter and change flavor. 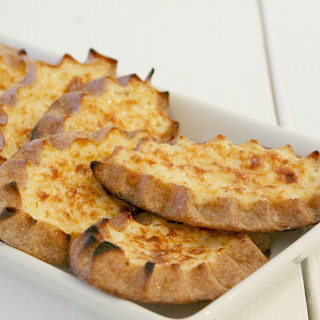 If someone asks from Finnish people, what is the most traditional and iconic Finnish food, I bet most of the answers would be "Karelian pies". These are rice porridge filled rye pasties, eaten with Egg Butter or butter, -and they are amazing. Nowadays people doesn't bake these at home so often than few decades ago, because more or less every store sell these. The quality of the pies varies a lot in stores, but still many think these are way too challenging to make by themselves. I know quite many people who haven't even tried to do these, not even once. Prepare the filling first. Stir rice into boiling water and cook for 10 minutes. Add the milk and let the porridge simmer for 30 minutes. Leave the filling, lid on, for 10 minutes. Season with salt and let it cool. Stir the egg in the cooled porridge. For the crust: Mix cold water, oil, salt and flours with a wooden spoon. Knead the dough until smooth and solid. Sprinkle on the table rye and wheat flour mixture and pour the dough onto the flour. Shape the dough into a log and cut into 24 portions and shape each into a round. On a lightly floured board, roll out each round into a 10-12 cm circle. Spread filling evenly on each round. 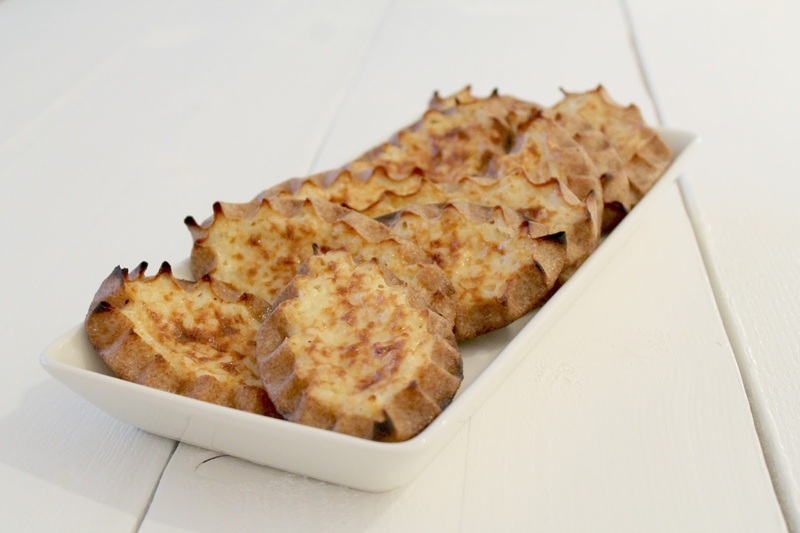 Fold two opposite edges of the pastry over the filling and crimp the edges of the dough toward the center to make an oval-shaped pastry, allowing about 1 cm of the crust to overlay the filling and leaving the center of the filling exposed. Slide the pies on the prepared baking sheet and bake the pies 275 C for about 10-15 minutes. In a small bowl, stir together the melted butter and hot milk and brush on the pastries. Pile the pies in a bowl and cover with parchment paper and cloth. Coffee & Chocolate bars - "Masaliisa"
During the 80's, there was no party where this confection wasn't served. Or was there? This pastry is, Mokkapalat or Masaliisa, to my mind, the most iconic pastry of that decade. I forgot this for years and years, until my husband mentioned this once. Name "Mokkapalat" is more common with Finns, but In Pori area they call it "Masaliisa". Even I'm not from that area I found the name so amusing, I startet to use it instead of "Mokkapalat"
To me, the best part of the pastry is the frosting, and there never enough it. So why not put it in to two layers? I kind og a made cake using this bar, and this way I managed to get more frosting into my piece of bar. Coffee & Chocolate bars "Masaliisa"
Mix all dry ingredients together (sugar, flour and baking powder) Put butter, water and cocoa powder intoa a pan and bring to a boil. Combine the flour mixture and cocoa mixture. Addt 1 dl (milk) coffee, and let cool. When the dough has cool enough, stir in the eggs. Spread on cookie sheet and bake at 200 degrees for 20 minutes. Let cool. Then split the cake in half. For the frosting, melt the butter in a saucepan and mix with other ingredients. Mix until smooth. If the mixture seems too stiff add a little e.g. milk, and if it seems too loose, you can add more powdered sugar. Keep the mixture warm for the frosting. 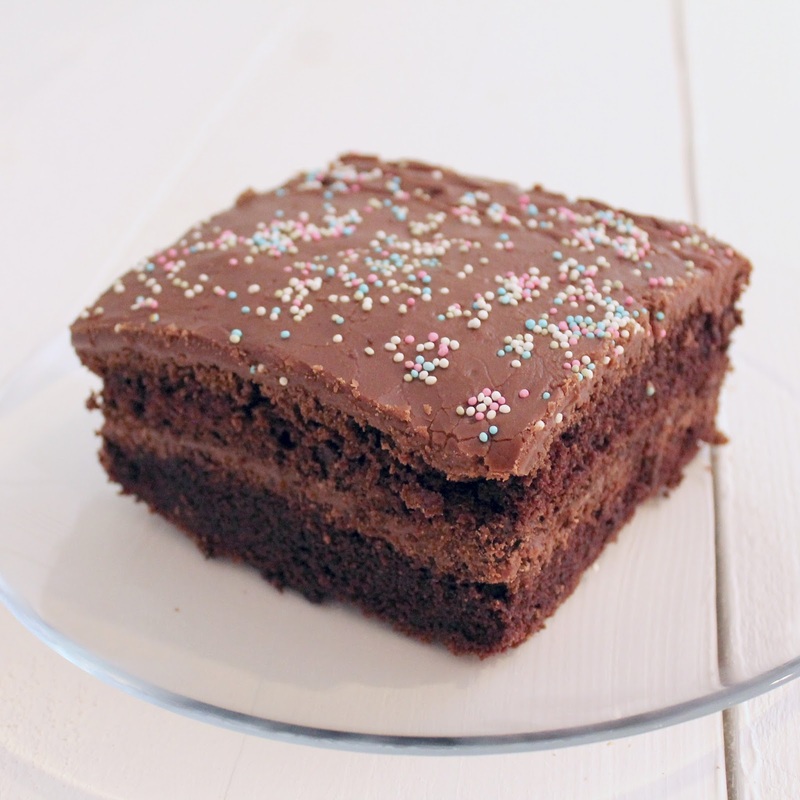 Spread the frosting evenly over the both cake pieces. Lift the other part of the on cake over the other. 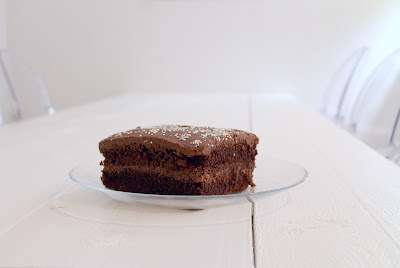 Sprinkle with nonpareil, and just Enjoy! The savoury porridges have been so trendy already for a short while, and I found myself thinking of those when I planned the menu for our dinner party on Friday. First I planned to prepare mushroom porridge, but then suddenly Heston Blumenthal, my idol, came to my mind. 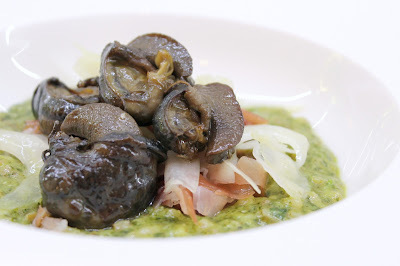 The legendary Fat Duck’s snail porridge, was under discussion a lot when it was invented, I wanted to try that. 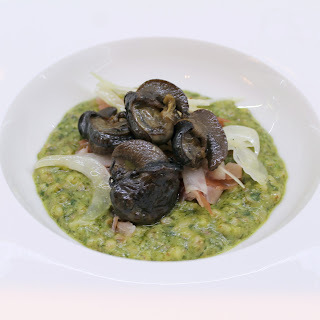 I found few almost similar but still different recipes when I was looking Heston Blumenthal Snail porridge recipe. I have heard that the book recipe is THE one, but because I couldn’t get that into my hands, I had to use one from internet. Or, I thought I do that. At the end, I combined some recipes and added my touch to the dish. I replaced the oats in the porridge with pearl barley and I was very happy about the result. At one day I’m going to try the porridge with oats as well, but I think my version was very nice. This dish was the 3rd course on my 5-course dinner, and the dish size was excellent. Finely shred the ham. Slice the fennel as thinly as possible and set aside. Heat the stock in a pan over a high heat and, once simmering, add the barley. Stir until all the liquid has been absorbed. Remove from the heat and beat in the snail butter. You may find you have to return the pan to the heat, in which case be careful: if it gets too hot, the butter will split, causing the porridge to become grainy. Season generously. Spoon the porridge on to the plates and top with ham. Toss the fennel with the vinegar and walnut oil, season, place on porridge, top with snails and serve. Blanch and refresh the garlic in boiling water three to four times (this might seem excessive, but the garlic will be bitter and aggressive otherwise). Finely chop the mushrooms; peel and finely chop the shallots. Heat 25 g butter in a frying pan and sweat the mushrooms and shallots for five to 10 minutes, until softened. Tip into a food processor, along with the remaining ingredients, then purée until smooth. This will take a few minutes because you'll have to stop the machine intermittently, to scrape the sides. Once puréed, rub the mix through a fine-mesh sieve on to a sheet of cling film and roll into a cylinder. Store in the fridge (it also stores well in the freezer). Then simply cut off segments of butter as and when required. For the wine, I thought of the region for a good pairing: Burgundy first! You can’t go wrong with a Chardonnay for buttery escargots. My favourite is Laroche Petit Chablis 2015. My challenge was carrots, yes you read right, carrots. But they do not exists in the dish?? No, they don't, but they were my 2nd dish in a menu, and I wanted to serve same wine with them too. I chose Chardonnay form California because I needed more toasty to the flavour. The wine was Jekel Gravelstone Chardonnay 2014. It was nice, but nothing special. 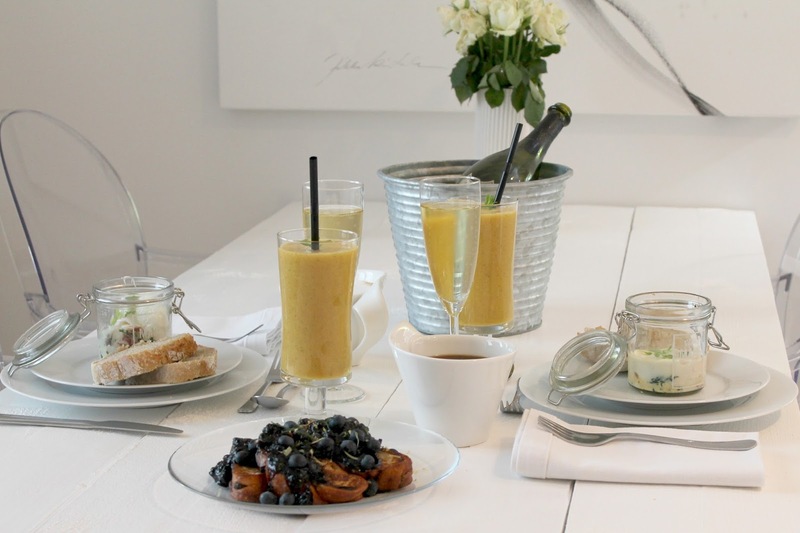 Sometimes, actually quite often, on Sunday morning we want to enjoy a homemade breakfast or brunch. My husband loves Eggs Benedict and especially Eggs Royale, and those particular dishes are very common in our table. This Sunday, I wanted to try something else, but something from eggs. I think the Eggs are crucial part of the breakfast or brunch. 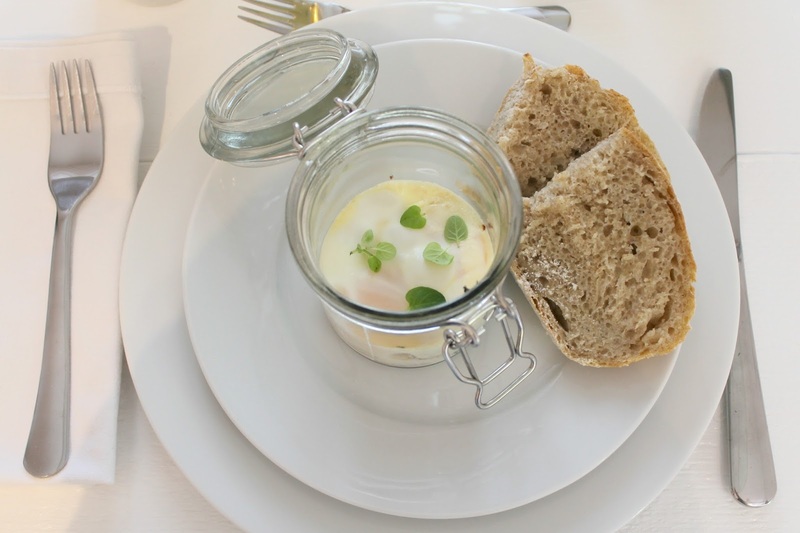 We end up to cook Eggs Cocotte, a classic French dish. I served it with a homemade sourdough bread which I made in the same morning, since nothing beats the oven-fresh bread. 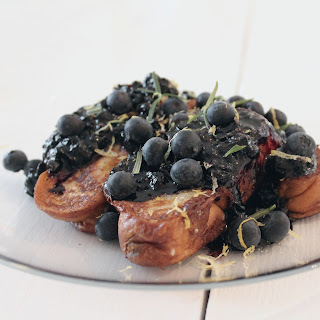 For the dessert I prepared French toast from Finnish pulla with Rosemary Bilberry sauce. Wow, what a dish! I almost started to cry, it was so damn delicious! Brunch needs one egg dish, and our favourite is Eggs Benedict or Eggs Royale, but this recipe is something different. 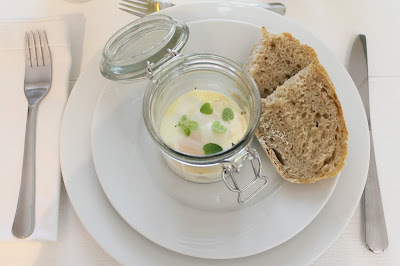 Fos last Sunday's brunch I made Eggs Cocotte, or Ouefs Cocotte in originally, for a change. This is easy but almost as good as Benedicts. Just put all ingredients in to a ramekins and cook. That's all you need to do. This is more healthy dish than Benedicts since there is no butter involved, just cream is used. But many qualitites which I like in Benedicts, is still in this dish. Eggs with runny yolks, ham and spinach. As an extra, salty cheese gives a nice addition to this dish kind of replacing the feeling of Hollandaise sauce. Size of this dish is quite small, so if you hungry or do not have anything else with this, I recommend to double the recipe. 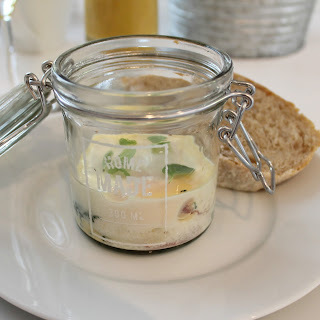 Divide spinach, prosciutto and cheese among ramekins, season with black pepper. 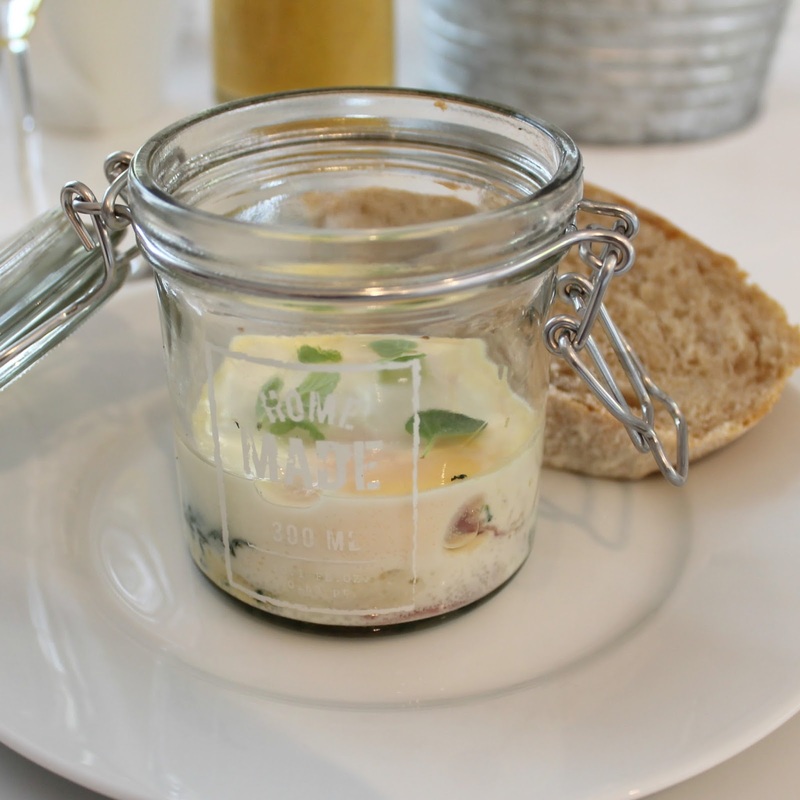 Crack in an egg and add a half of the cream to each ramekin. Place bowls in a baking dish, and pour hot water into baking dish until it is halfway up the sides of the bowl. Transfer baking dish to oven, being careful not to let the water splash into the bowls. Bake for 10-15 minutes or until whites are set and the yolk is still soft. Serve with slice of good quality bread. Foodie from Finland whose motto is: "There is always right time for champagne!" Copyright © Ninnin köökki. All rights reserved.. Simple theme. Powered by Blogger.